Gifting is joy. Receiving gifts is even more joyous. That moment when we see a happy smile in the faces of our loved ones, nothing can replace it. Today I am here to introduce you all to an exclusive online Gifts Store. Well, there is nothing amazing like walking into a store with our gift list and finding something nicer and suitable for everyone under one roof. I felt the same when I first landed in the homepage of Indian Gifts Portal. Yes, it was like filling my cart with almost all the items in my gift list. Indian Gifts Portal is a largest one stop destination to buy gifts for all ages – and of course, for every occasion and all around the world. IGP helps with our gifting challenges with their experience in gifting solutions. Let us begin the shopping by setting up categories of all the people we plan to gift. And then its time to sit and relax, knowing we arrived at the right store where they take care of every gifting needs. Technology has shrunk the world into our palms and while we shop in the luxury of our home, we still find it a difficult task to send packed presents to our family and friends who stay abroad. So we end up mailing greeting cards or send them belated gifts. Now sending fresh flowers, chocolates, cakes or any personalized gifts outside India and that too at the earliest, is no more a mission impossible. As a blogger, this feature grabbed my attention. Previously I have conducted writing contests in my blog and the winner’s prize items or gift vouchers were only been delivered within India. IGP comes handy with its Global Gift Shops, now I can send prizes/gifts to both National and International fellow bloggers. Feeling awesome at the thought of it! Last week it was Eid ul Fitr. And I was planning to give my Mom a special surprise. I surfed through Eid-Ul-Fitr gifts under the category Occasions. I was overjoyed with their tasteful collections. From gold plated ceramic calligraphy plates to Attars to Dates to Candle holders etc. The list goes on and on. Each item was lovely and I ended up in confusion on what to buy. So many things fascinate women. But Jewelry is still our top favorite. Can you deny? I scrolled into the jewelry section. 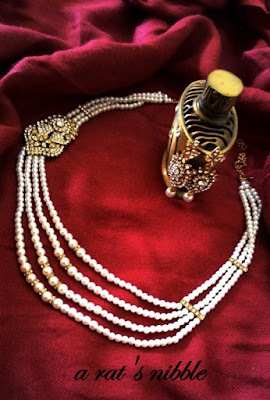 From their wide range of selection, this pearl necklace set caught my attention. Not only the quality and the design but also its affordable price. I hit the ‘Buy Now’ button and was waiting for it to arrive. I received the package in 5 days. It was in an exclusive gift box. The necklace set was beautiful. All this I got for a reasonable price. I’m thrilled that I came across this site on a right time, and my Mom was so delighted with this sparkling surprise. I love gifting and thanks to IGP, now I can do it any day. And the happiness on the faces of my loved ones when unwrapping gifts makes me feel blessed. With friendship day approaching, what are you waiting for? Click Here for a wonderful range of personalized gifting options for your friends. IGP has a great collection of gifts. You find an occasion, IGP offers variety of ideas with great discounts. Everything is just one click away. So are you ready for happy gifting? There is also an exciting news from IGP. With Rakshabandhan round the corner, IGP wants us to let the spirit of Brother-Sister Relationship outshine. Let us grab this opportunity to share the stories of our siblinghood. For which IGP offers amazing gift hampers. Click Here to know more about it. Goodto know about IGP. Thanks for sharing. Yeah it is! They have good gifting solutions. Interesting Thanks for sharing !